It’s like Kathleen Hanna did double mitosis…and they became Hinds. In the world of synth-dependent song-crafting, it is refreshing to encounter an all-female band who recedes the raw instrumental style that icons like Kathleen Hanna have used. Hinds is a garage rock quartet from Madrid who are planning to debut their first album Leave Me Alone next January 8th and so far, their first single “Garden” time-machines us to Kathleen Hanna’s Le Tigre days. The glimmering guitars muffling up the unrefined vocals gives us the rare sonic closeness to the artists voice. There are no synth layers to peel, taking us back to those olden days of free concert-hopping in your neighborhood’s garage. The complementary lemonade sucked, but it was a free show. 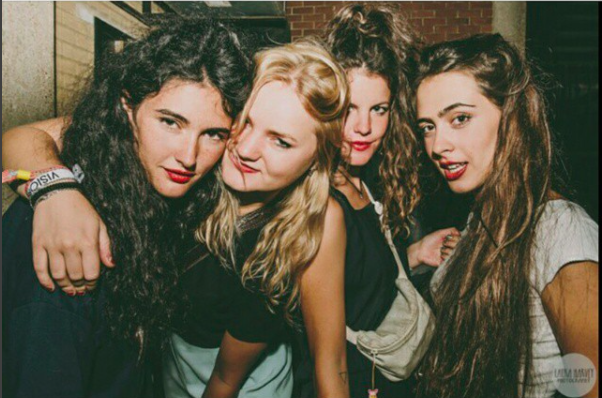 Hinds is currently on tour and will be hitting North America for the most part of fall and ending it in Europe. While their shows are not free and might cost a fortune (like TENS of dollars), garage rockists and Loreal-hair enthusiasts should go see them.